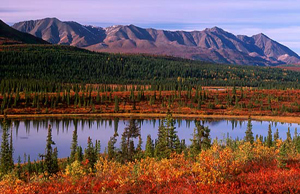 Because of its size, Alaskan weather patterns change according to area and season. Summer temperatures range from 15°C-26°C (60°F-80°F) during the day, with morning and overnight temperatures dropping down to 4°C-10°C (40°F-50°F). Central Alaskan summers are warm while the south-east of Alaska gets the most rainfall. The far north has 24-hour sun during June and July whereas the southeast gets an average of 17 hours of sunlight across the same period. During winter, nights are long, temperatures get down to -45°C (-50°F) in some areas and the skies open up to the incredible northern lights. Flights to Alaska can deposit you in Anchorage, Juneau, Ketchikan or Fairbanks. If driving you'll find yourself motoring up the Alcan (also known as the Alaska Hwy), and if arriving by boat then it'll be a trip along the Inside Passage waterway. Anchorage International Airport (ANC), 11km (7mi) west of the city centre, is Alaska's largest airport and is serviced by major airlines but most travellers from Asia or Europe will need to touch down in Seattle, Los Angeles, Detroit or Vancouver first and catch a connecting flight to Anchorage. You can drive or take a combination of buses along the Alcan into Alaska. Good tyres are essential on this road. Ferries run from Bellingham, Washington, take between two and four and a half days to reach Juneau (depending on the route) and are a scenic and hassle free way to get to Alaska.